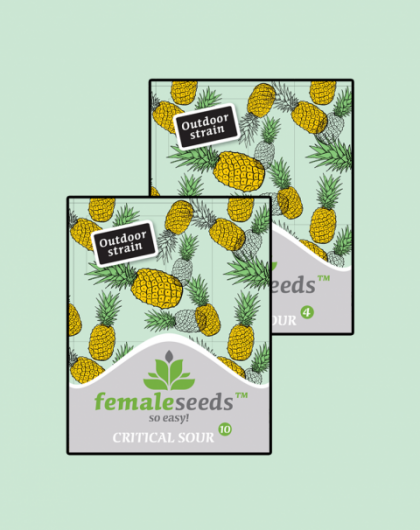 Critical Sour from the female seeds company is a new strain developed with the outdoor grower with a short flowering season in mind. Indica dominant genetics have been crossed with Autoflowering genetics to create a big yielding plant that can finish as early as September outdoors. The Critical Sour can be considered the next generation of hybrids from Female Seeds. Our goal was to create a very early maturing outdoor strain. Depending on your region she can finish as early as the beginning of September! A big producing strain covered in trichomes. A Maroc x Grapefruit mother was crossed with an inbred Auto NL x Auto NL x Auto Critical father to speed up flowering. This strain develops specific features clearly inherited from the mum and the Auto Critical genes. She is easy to grow as she is a very hardy plant. She stays shorter than any of our other outdoor strains. One in thirty plants can autoflower. The Critical Sour is an indica-dominant strain, compact, with a sturdy and flexible stem, with wide internodes ready to stretch when kicked into flower. The average plant’s flower-to-leaf ratio is impressive, with much more flower than leaves. It has a vigorous production of thick, resinous and dense buds. The buds grow long, quite slender. The open bud structure allows good air circulation and helps prevent mould in the final stages. She has a very nice aroma; fruity, earthy and spicy. Critical Sour is not too smelly so perfect for stealth growing. The gentle and delicate taste while inhaling reminds you of the fabled pineapple pheno of the Grapefruit. A spicy/earthy hint is added due to the Maroc and the Auto NL genes help develop a very exciting palette. The high can be described as an almost instant body-high. It combines the strength and couch-locking effect of the NL and Critical with the more tender and subtle high of the Maroc and Grapefruit. The high is therefore a sudden happy and uplifting high that wraps the entire body with its pleasant feeling. Natural pain reliever well known for helping against stress, anxiety, nausea or arthritis.